Free and rapid imagery was provided through the USGS Hazard Data Distribution System for Hurricanes Harvey, Irma and Maria — the calls for assistance started days before Hurricane Harvey came barreling across America’s doorstep this summer — first responders and government officials needed answers to prepare and protect communities. How strong is this storm going to be? What kind of damage occurred on its path through the Caribbean? 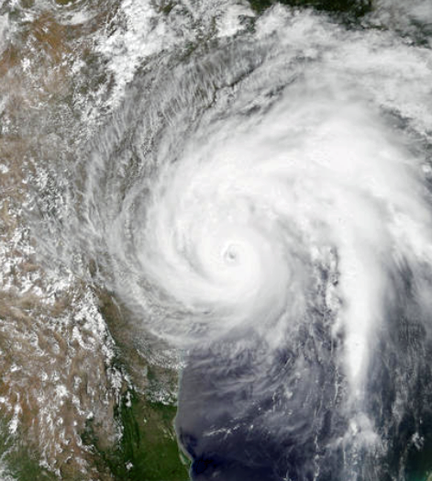 How might it impact southeast Texas once it makes landfall? This natural color image of Hurricane Harvey was acquired by the Moderate Resolution Imaging Spectroradiometer on NASA's Terra satellite as the hurricane reached the Gulf Coast of Texas at 12:25 p.m. local time on August 25, 2017. Remotely sensed imagery was provided — at no cost and almost daily — through the USGS Hazard Data Distribution System (HDDS) for analysis on the extent, severity and evolution of hurricanes Harvey, Irma and Maria. 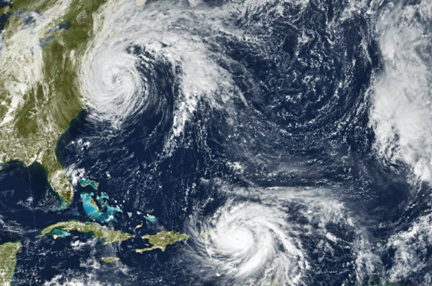 Brenda Jones, who is the disaster response coordinator for the USGS Earth Resources Observation and Science Center (EROS), reported that USGS staff worked around the clock to keep HDDS populated with satellite and aerial imagery. 15,000 images were downloaded from HDDS following the three storms. Requests came from 48 government agencies, including the U.S. Senate, Foreign Agricultural Service, Department of Homeland Security and the Centers for Disease Control and Prevention. As an example, Harvey dropped as much as 52 inches of rain in Houston and the Federal Emergency Management Agency used data from HDDS to identify roads and other infrastructure that were under water in an effort to better direct rescue efforts. Image of Hurricane Maria and Tropical Storm Jose acquired by the Geostationary Operational Environmental Satellite 13 at 1:15 p.m. local time on September 19, 2017. The satellite is operated by NOAA while NASA helps develop and launch the GOES series of satellites. HDDS is useful for numerous hazard situations in addition to hurricanes. For example, following the recent earthquake near Mexico City, imagery provided through HDDS allowed first responders to see collapsed buildings, blocked roads and damaged infrastructure. During fire season, HDDS makes it possible for first responders to have wide-scale pictures of situations. HDDS acquires imagery and data from several sources, including the International Charter for Space and Major Disasters, of which the USGS is a member. Once the hurricane season blossomed, USGS EROS staff began pulling data acquired by space and aerial systems and loading them into HDDS.